Over the years I have been privy to watch a few housing booms take place. Seeing the “Under Construction Signs” kept people satisfied and waiting for how things would be once the building of new homes, stores and restaurants were completed. The problem was that people’s satisfaction was never fully reached. The prices that needed to be paid for all the homes, amenities and new construction could not be fully funded and maintained. The housing market took a huge hit and eventually crashed. People were left to walk away from homes that they couldn’t afford. God isn’t finished with us yet. Unlike the housing market crash, where there is a rise and fall, depending upon the economy, we cannot read the words of Ephesians 1:7 and overlook the Cross. On Calvary, Jesus saved us ​from ourselves by paying full price up front with His redeeming blood. 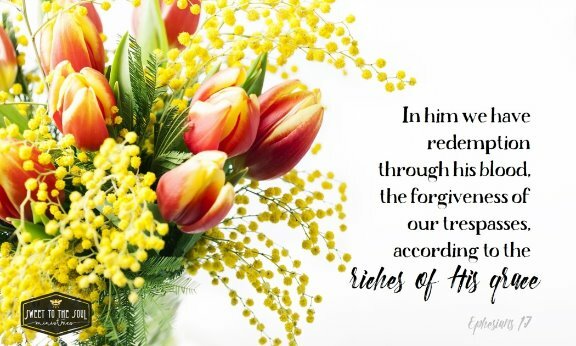 God is at work through His Son Jesus, constantly renewing us, forgiving us of our sins and giving us eternal life, all this according to the riches of His grace. Grace is defined as: the free and unmerited favor of God, as manifested in the salvation of sinners and the bestowal of blessings. Because of God’s grace, we receive what we don’t deserve, the mercy of a true and loving God. God lavishes us with the riches of His grace! Our sins are overlooked and dismissed, set aside, ignored and forgiven. We don’t have to hide from our self, each other or God. Once we become a believer, we get to step over and over again into the acceptance of Christ. We are liberated, freed and restored to usefulness. What a true blessing that God accepts us “under construction sign” and all. The Cross argues on our behalf that the price has already been paid in full and this is what the Apostle Paul calls the riches of God’s grace. The cross argues on our behalf that the price has already been paid! Let us never forget that our achievements in the light of that which is enduring are worthless. In our natural, sinful state, we were useless, not effective or ready for what we were called to do or accomplish. Why do we need to remember this? Because we are prone to look pridefully at our achievements and see them as something they are not, instead of seeing that by God’s grace we are able to accomplish all that we do. Finally, let’s notice that there is a considerable difference between achievement and fulfillment. There is no satisfaction or usefulness in a person before Christ. Everything is a waste of time. Our achievements disappear. They are worthless. What we really need, money, brains and brilliance can never buy. That is why Ephesians 1:7 demonstrates the need for God’s grace so clearly. Beloved, with Christ and as a believer, we get to cover up our “Under Construction Sign” with signs that read: I have be forgiven! I have been set free! God fully accepts me! In whom, He is well pleased! By, His blood, I have been made white as snow! We experience grace often and need it all the more. It is His grace that changes us and causes us to see ourselves the way God does all the more, forgiven, whole again, worth a great deal and made in His image. Oh how He loves us. This is the life of a Christian, redeemed, forgiven and daily in need of God’s grace. ​I'm Misty Keith and ​I am a daughter of the King of all Kings, wife to Richard, Mommy to Reagan (11 years), Kylee (8 years), and Karis Delaney (6 years). I am a teacher by trade, an encourager and up-lifter by calling and a writer by practice. I understood from early adulthood and beyond that I would never fit. The Lord helped me to realize that He called me to stand out and because of this, I am forever grateful and at peace with how He has made me and who He has made me to be. My family and I live just outside the Austin, Texas area. I homeschool all three of my children and teach Reading for a private college in the Master’s/Credentialing program. I stay busy and enjoy the hobbies of Reading, Writing, Scrap-booking and Running. As a family, we attend Hill Country Bible Church. We enjoy traveling and take “family fieldtrips” often. All of life is an adventure and we are thankful for every life lesson that the Lord teaches us in the process. Hello Misty! Glad to see you here. Thanks for reminding us of the riches of God's grace. Our sin's been paid in full and up front. We'll never get eviction notices like those folks in California! Blessings, Soul Friend!